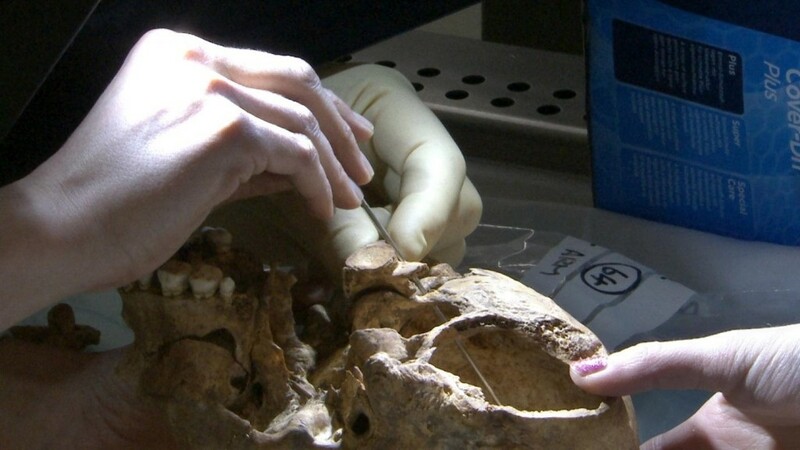 The sequence – showing the dramatic injury to the base of the skull as well as the inside of the top of the skull – is part of a package of films charting the scientific and archaeological investigations led by the project team from the University of Leicester. Drawing on 19 years of experience as a Home Office Forensic Pathologist, Professor Rutty examined the skull and linked marks on the vertebra, the smaller of the two wounds to the base of the skull and a mark on the inside of the skull, suggesting that weapon had been thrust up from the base of Richard’s neck and into his head. Professor Rutty said: “I approached this examination as that of any patient – just because he was a King did not make a difference. Everyone is treated the same with the same doctor/patient relationship, the same respect in death and the same level of professional investigation. “The key to this sequence is that alongside my role at the University of Leicester, I am a Home office forensic pathologist. Thus I was able to look at the large injury in the base of the skull and, through experience, I was able to identify the key injury. “Using the specialist lighting equipment we have in the forensic mortuary at the Leicester Royal Infirmary, which was key to the examination, I then was able to put the three injuries together on pathological grounds and we all realised I had identified the potential lethal injury to King Richard III. The video shows the initial examination of the trauma to the skeleton by Professor Rutty working with Dr Jo Appleby of the University’s School of Archaeology and Ancient History. Osteologist Dr Jo Appleby, who led the exhumation of the skeleton from the Greyfriars car park where Richard was discovered in 2012, said: “Following the identification of a major sharp force trauma to the base of the skull, which was probably inflicted by a sword or the top spike of a bill or halberd, we were interested to determine the angle of the blow. “During filming, Professor Rutty noted a small traumatic lesion on the interior surface of the cranium, directly opposite the sharp force trauma. Careful examination showed that the two injuries lined up with one another, and also with an injury to Richard’s first cervical vertebra. The researchers, who examined the remains in a clinical environment at the Leicester Royal Infirmary, have already published in The Lancet their research into the trauma inflicted on King Richard III’s body at the Battle of Bosworth Field on 22 August, 1485. Using modern forensic analysis of the King’s skeletal remains, they discovered that three of his injuries had the potential to cause death quickly- two to the skull and one to the pelvis. The forensic imaging team, working with the Forensic Pathology Unit and our Department of Engineering, used whole body CT scans and micro-CT imaging of injured bones to analyse trauma to the 500-year-old skeleton carefully, and to determine which of the King’s wounds might have proved fatal. They also analysed tool marks on bone to identify the medieval weapons potentially responsible for his injuries.